The dissertation work for the MRes at CASA is at full speed. The working title for my piece of research is ‘Does silence produce happiness? Ambient sound and emotions in urban environment’. Data that I collected in collaboration with another student (under guidance of Panos Mavros) include EEG, sound level (dBA) and gps for routes between two locations in London. One of the routes is supposed to be pleasant and the other one is unpleasant. I expect to see some interactions of sound levels and emotional states while people walk along these routes. The EEG data is translated by a software package into four emotional states: excitement, engagement, frustration and meditation. The EEG, sound level and gps data are merged using the time stamps, so that I can start analysing how the emotional states vary throughout the route. My focus is on the emotional states and sound levels, and the task for the next few weeks is to start drawing basic statistics from the datasets and then move onto the ‘proper’ analysis. 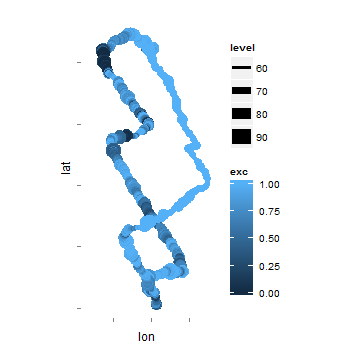 I am doing the analysis in R.
Here’s the first plotted dataset (with R script by Panos). It doesn’t have a base map, but the location at the top of the routes is the UCL student union building near Euston Road, and the location at the bottom of the routes is Soho Square. The ‘level’ is the sound level in decibels and ‘exc’ is the excitement levels (rated from 0 to 1). I will be posting about the progress over the next couple of months.